Whenever the topic of run & gun games comes up, someone has to mention Contra as the greatest of all time. Contra certainly has it’s place in the genre, but for my money it doesn’t get any better than the Metal Slug series. This first installment in the franchise is set is a modern version of WWII Europe, not unlike the Strikers 1945 series. The game gets it’s name from the player-driveable “metal slug” tanks that are strategically placed throughout the stages, and provide both shelter and extra firepower just when you need them. The game is also famous for its myriad of weapon power-ups. The default weapon is a puny handgun, but power-ups are primarily earned by freeing POWs, who then give you a gift. Heavy machine guns, rocket launchers, shotguns and flamethrowers all help you lay waste to the neverending waves of enemies. You can also carry up to 10 grenades, which are perhaps the most powerful weapon in the game. As expected, each of the 6 stages culminate in a unique boss battle. Although the game certainly is violent, its also defined by it’s goofy, comical atmosphere, never taking itself too seriously. The graphics are gorgeous, the music is perfect for the genre, hell even the sound effects are awesome. I never get tired of the screams of my slain enemies, the satisfying boom of a shotgun blast, or the “thank yous” of newly-liberated POWs. I always tell myself when I start a game that I’m only going to use a fixed number of credits to see how far I can get, but the game is so addictive that I can’t help but pump more credits into it once mine run out. I never sit down to play the game without finishing it, no matter how many continues it takes me. The only reason that I didn’t give this game a perfect score is that the final stage is ridiculously hard, and in my opinion was only meant as a cash grab. It doesn’t matter much to me as I’m playing it at home, but it would have been a bummer in the arcade to get that far in the game only to have to start pumping quarters into the machine because of the cheap deaths. 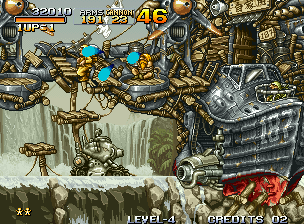 The affordability of games like Metal Slug is the most compelling argument for either playing with a consolized MVS, or investing in a MVS -> AES converter. Buy Metal Slug on GameGavel or Amazon. Tagged 1996, Action, AES, Arcade, Metal Slug, MVS, Nazca, Neo Geo, Review, SNK. Bookmark the permalink.